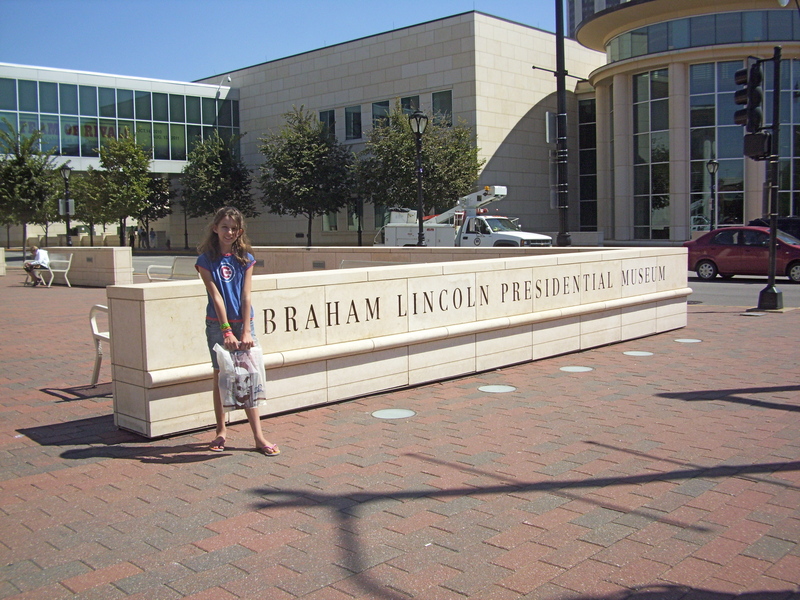 WHAT: The Abraham Lincoln Presidential Museum opened in April 2005. WHY GO THERE: The museum is not the static room after room of traditional artifacts behind glass. Instead the use of technology makes each exhibit different from the others. When the museum was first built, the planners faced controversy as it was dubbed Lincolnland by the traditionalists. But since that time it has won an award for : being the greatest achievement in America to encourage the study and appreciation of Abraham Lincoln and the times in which he lived. WHAT’S THERE: Lots of different exhibits portraying Lincoln’s life, but in particular, I liked seeing an original copy of the Gettysburg Address and Lincoln’s stovepipe hat with his fingerprint impressions on the rim. KID-FRIENDLY: Yes. The 10yo liked the two shows and Mary’s dresses. Not overly interested in the exhibit part. (The wall of political cartoons is fascinating. Lincoln was not only liked by many, but he was NOT like by many others. The museum also has a Mrs. Lincoln’s Attic room which is dress-up clothes (dress up like Abe and Mary), books, toys, etc. The 10yo, almost 11yo was just a little too old to really get into the things in the room, but younger kids would have a lot of fun. (And she might’ve been more willing to participate if her sister had been with her.) She did LOVE the gift shop. ANYTHING TO EAT? Yes, there is a Subway at the museum. WOULD I RECOMMEND YOU VISIT: This was actually my third time there. I went with Ken RIGHT after it opened in 2005. Later, my mom and I were in the area for a funeral and we went. I would go again. They do have a great gift shop with lots of books, DVDs and other Lincoln/presidential memorabilia. I would go again too! I went in high school sometime, but it would be fun to go again! Yes, it’s fun … and more to learn all the time.